When implementing a 3 x 3 display with PresenterWall, set up is made easy with SmartAVI’s point-and-click software. End users have the ability to set up each monitor individually (such as resolution and color quality) and then can “add” them to the PresenterWall system. For greater flexibility and simplicity, you can also define your video wall configuration within the software, and with one click, set all of the monitors in the group at the same time. This enables the software to communicate with each monitor separately or as part of a larger grouping for stretched/tiled images and video. Option 1: 3 x 3 complete processor based on Windows® XP, running an Intel® quad-core CPU capable of supporting a 2 x 2 video wall displaying HD content on either VGA or DVI monitors. Option 2: 3 x 3 complete processor with a 4-port video capture card based on Windows® XP, running an Intel® quad-core CPU capable of supporting a 2 x 2 video wall displaying HD content on VGA or DVI monitors from a hard drive or DVD. 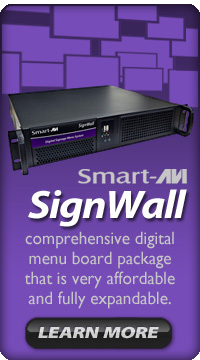 Categories: video wall, video wall hardware | Tags: video wall, video wall hardware | Permalink. 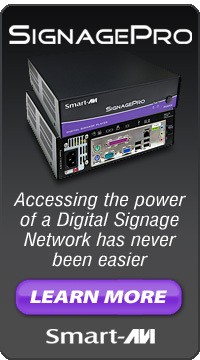 When implementing a 2 x 2 display with PresenterWall, set up is made easy with SmartAVI’s point-and-click software. 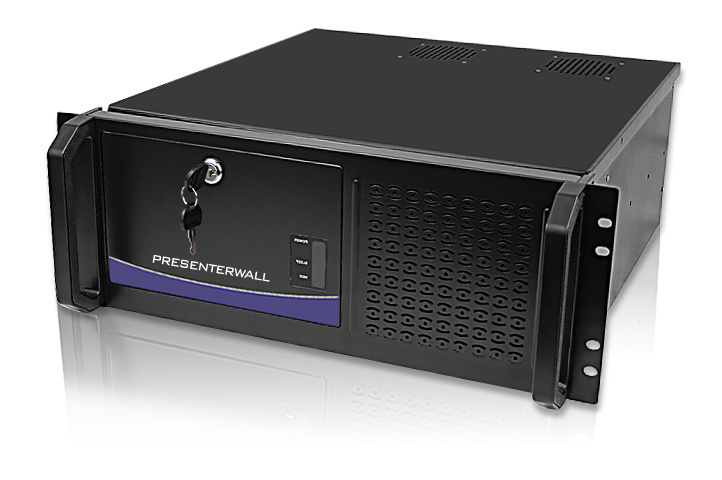 End users have the ability to set up each monitor individually (such as resolution and color quality) and then can “add” them to the PresenterWall system. For greater flexibility and simplicity, you can also define your video wall configuration within the software, and with one click, set all of the monitors in the group at the same time. This enables the software to communicate with each monitor separately or as part of a larger grouping for stretched/tiled images and video. Option 1: 2 x 2 complete processor based on Windows® XP, running an Intel® quad-core CPU capable of supporting a 2 x 2 video wall displaying HD content on either VGA or DVI monitors. Option 2: 2 x 2 complete processor with a 4-port video capture card based on Windows® XP, running an Intel® quad-core CPU capable of supporting a 2 x 2 video wall displaying HD content on VGA or DVI monitors from a hard drive or DVD. 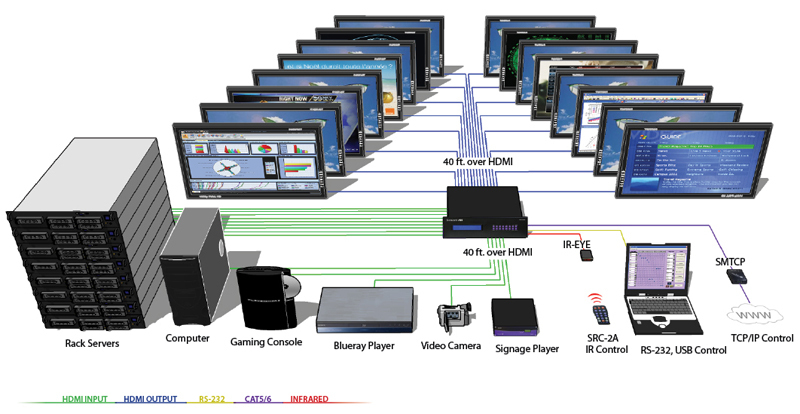 Display content from any 16 HDMI sources on any 16 displays independently up to 40 feet away. The HDR16X16 conforms to the HDMI (High Definition Media Interface) standard and provides a connection to view any sixteen HDMI video sources on any combination of sixteen video displays. The matrix configuration provides maximum flexibility, allowing switching between any high-definition source and/or display. The SmartAVI HDMI Router 16X16 provides HDMI output up to 40 feet and at HDTV resolutions of 480p, 720p, 1080i and 1080p. The system works with HD-DVD players, TiVo systems, HT PCs, and satellite set-top boxes that connect to an HDMI display. And users can switch to any source locally or remotely via a RS-232, IR, USB or TCP/IP connection. Our HDMI router is controlled by Windows®-based software that is easy to understand and simple to use – a cornerstone of all SmartAVI products. Categories: digital signage, digital signage hardware, hdmi, hdmi extender, hdmi matrix, hdmi switch, rs232, video switch, video wall, video wall hardware | Tags: digital signage hardware, hdmi, hdmi extender, hdmi matrix, hdmi switch, rs232, video wall, video wall hardware | Permalink. 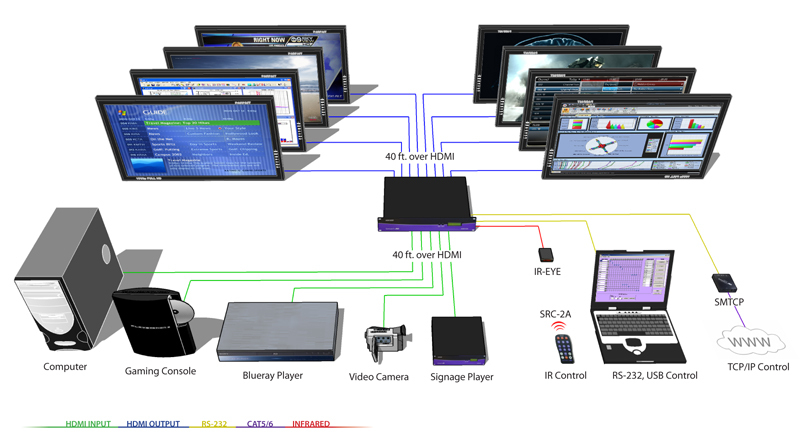 Display content from any 8 HDMI sources on any 8 displays independently up to 40 feet away. The HDR8X8 conforms to the HDMI (High Definition Media Interface) standard and provides a connection to view any eight HDMI video sources on any combination of eight video displays. The matrix configuration provides maximum flexibility, allowing switching between any high-definition source and/or display. 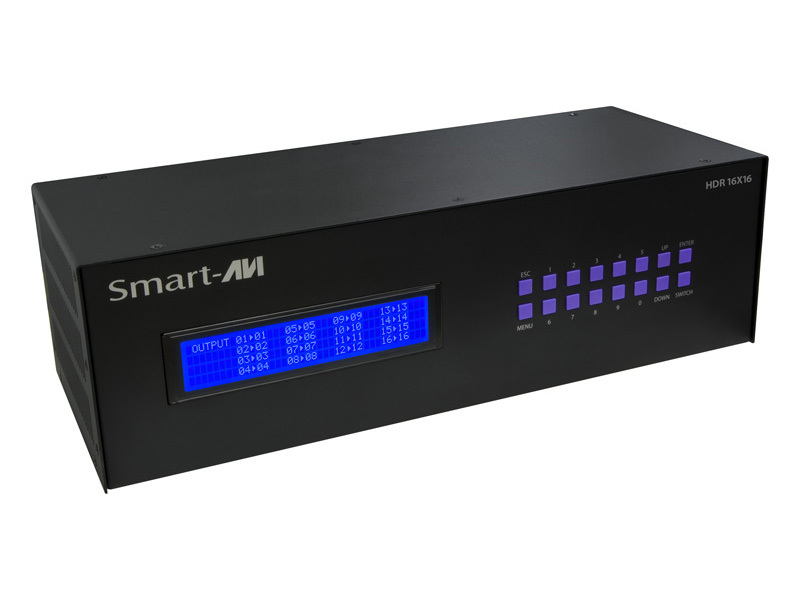 The SmartAVI HDMI Router 8×8 provides HDMI output up to 40 feet and at HDTV resolutions of 480p, 720p, 1080i and 1080p. The system works with HD-DVD players, TiVo systems, HT PCs, and satellite set-top boxes that connect to an HDMI display. And users can switch to any source locally or remotely via a RS-232, IR, USB or TCP/IP connection. Our HDMI router is controlled by Windows®-based software that is easy to understand and simple to use – a cornerstone of all SmartAVI products. 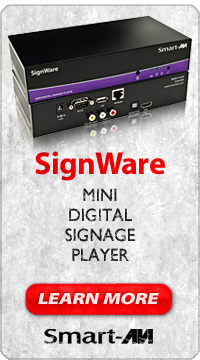 Categories: digital signage, digital signage hardware, hdmi, hdmi extender, hdmi matrix, hdmi switch, video switch, video wall, video wall hardware | Tags: digital signage, digital signage hardware, hdmi, hdmi matrix, hdmi switch, home entertainment system, rs232, video wall, video wall hardware | Permalink. The HDX-Plus uses two CAT5 UTP cables to extend HDMI signals such as HDTV output over 200ft (60m) from the source. It is capable of transmitting high-resolution HD video up to 1080p. Controlling your video source is easy with the HDX-Plus’ bi-directional IR and RS-232 extension. Whether it’s for a home entertainment system or a commercial installation, the HDX-Plus delivers flexibility and control. 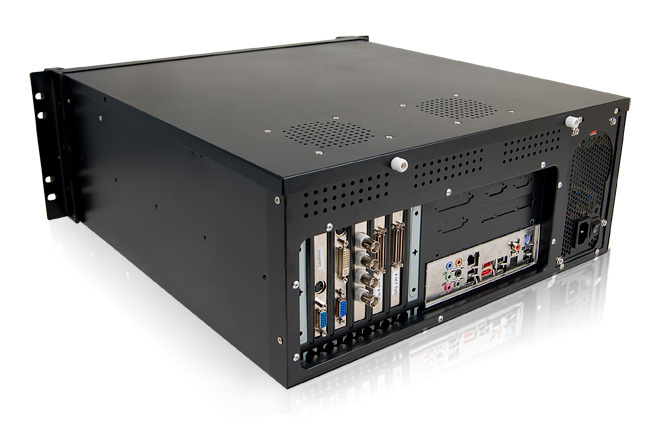 The HDX-Plus series enhances any presentation from commercial products to corporate financial data. It can be used in show rooms, board rooms, trade shows and window displays. HDX-Plus can be used in educational presentations to multiple locations, in schools and in other training facilities. Categories: hdmi, hdmi extender, hdmi matrix, hdmi switch | Tags: gadgets, hdmi, hdmi extender, hdmi matrix, hdmi switch, home entertainment system, technology, video | Permalink.